Chor-Minor, Chor-Minor Madrasah, Sights of Uzbekistan, Sights of Bukhara. 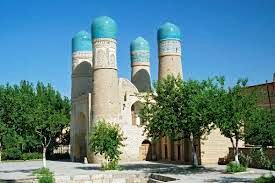 Chor-Minor is known as madrasah Halif Niyazkul (in Persian “Four minarets”) was built by merchant in 1807 in Bukhara. Entrance in madrasah reminds buildings with four towers like minarets, that’s why the building is called Chor-Minor. The building is located in an open area behind Labi- House. Madrasah construction is very unusual, so Chor-Minor is considered only as gate of the lost madrasah. However, if you look attentively, you will see that Chor-Minor is a complex consisting of buildings which have at least two functions – ritual and residential. The main building with towers is a mosque. Despite its unusual construction, the mosque has rather ordinary interior. People often performed ritual ceremonies, which included recitation, singing and instrumental music. Also living rooms are attached to the walls. Thus, for the functioning of madrasah lacks only a classroom – “darshona” and some outbuildings like dining-room “oshhona”. There were not classrooms in Bukhara. Such madrasahs were used for student hostels. All minarets have different shape and design. In some elements you can see something resembling a cross, the Christian fish and Buddhist prayer wheels. It’s believed that such decoration reflects religious - philosophical comprehension of the four world religions.